Pacific coast of South America, offshore islands of Chile and Peru. from the fat layer under the skin but now they are threatened by commercial fishing reducing their food supply, sea pollution, and increasing water temperatures. They dig underground burrows to shelter from the heat and to keep their eggs and chicks safe. 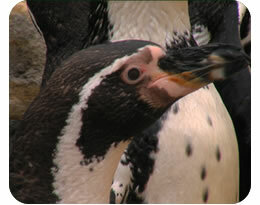 One of the first threats to Humboldt’s penguins was ‘poo’! Guano – the dried droppings of seabirds– was collected for fertiliser in the 19th century, disturbing and destroying penguin nesting sites.